South Philly's Matthew Franklin won his second classic shootout over Marvin Johnson of Indianapolis on this day in 1979. The victory earned Matt the WBC world light-heavyweight championship. It wasn't a surprise that the fight was a brutal, bloody and extremely competitive contest. The second affair was perhaps not quite as epic as their first battle, which Franklin won at the Spectrum in two years before, but the rematch was an intense encounter with Johnson's world title at stake. Johnson jumped out to an early lead in the fight and more or less controlled the bout most of the way. He cut Franklin badly and pounded him with both fists. Franklin just simmered throughout, landing his own share of punches, but not really making much headway. But Matthew Franklin never seemed too rattled by the punishment his opponents dished out. He had a slow fuse, and during his prime years, always found a way to win. This fight - the most important one of his career up to that point - was no different. With a heavy flow of blood streaming down his face, with his trainer Nick Belfiore watching through tears from the corner, and with a surging and confident champion still throwing bombs his way, Matthew Franklin turned the fight around in round eight with one explosive rally. He popped Marvin Johnson with a crushing right hand to get things started. The two furiously thrashed each other for about a minute until another right hand dropped Johnson in his own corner. Of course Marvin got up. He was always ready to rumble. But referee George DeFabis stopped it before the sagging, glassy-eyed warrior could take more punishment. The time was 1:44. It was another breathtaking victory for Franklin, but par for the course in the career of Philly's most exciting fighter ever. 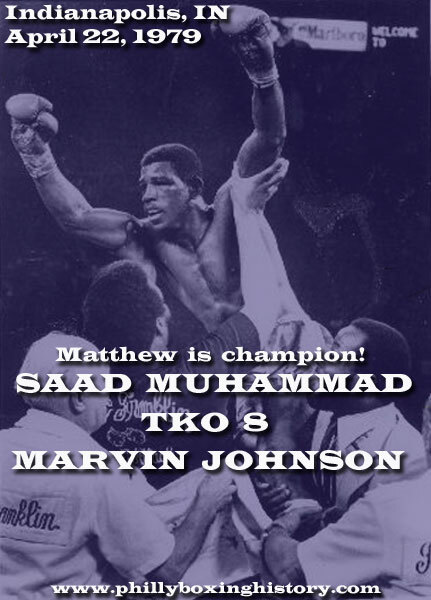 Just before the fight, Matthew Franklin announced that he had embraced the Muslim religion and was changing his name to Matthew Saad Muhammad, beginning immediately after the bout. As Saad Muhammad, Matthew had many, many more classic encounters to come. He defended his crown successfully eight times in one of the most exciting title reigns of the 1980s - and of all time.